Sharon Campbell, professor of biochemistry and biophysics, has been awarded the 2014 Hyman L. Battle Distinguished Cancer Research Award by the UNC School of Medicine. The award recognizes sustained, exceptional cancer research over a career by School of Medicine faculty. Dr. Campbell’s research focuses on the Ras and Rho families of proteins. Mutations in the genes that produce these proteins are found in many forms of cancer, making them promising targets for therapy. The Battle Distinguished Cancer Research Award, established in 2007 by the Battle Foundation of Rocky Mount, N.C., recognizes exceptional cancer research at the UNC School of Medicine and comes with a $25,000 prize. The Battle Award fund is a permanent endowment held by the Medical Foundation of North Carolina, Inc. An official reception honoring Dr. Campbell will be held in August. After postdoctoral training in the departments of Biochemistry and Physics at Brandeis University, she became a research scientist at DuPont Central Research and Development. Her research efforts at DuPont led to solution structure determination of the Ras proto-oncoprotein by NMR spectroscopy. In 1994, she left DuPont-Merck to become a faculty member at the University of North Carolina. As a junior investigator at UNC, she received both the Jefferson Pilot and Hettleman awards. Her lab studies Ras superfamily GTPases as well as cell adhesion proteins that regulate cellular growth and motility. Her research employs a combination of biochemical, biophysical and structural biology approaches to characterize protein-protein and protein-ligand interactions, elucidate structures and characterize novel mechanisms of regulation. 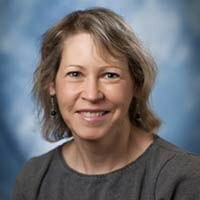 Her structural and mechanistic studies of tumor promoter and tumor suppressor proteins at UNC, have led to the identification of novel effector interactions and post-translational modifications that drive Ras-mediated tumorigenesis, as well delineation of interactions critical for focal adhesion kinase and vinculin-mediated cell motility. Results from her studies on Ras, could provide the break-through to finally developing pharmaceutical targets mutant Ras proteins, which in turn could provide improved treatment of lung, colorectal and pancreatic cancers. She currently consults and works with companies to develop Ras and focal adhesion kinase inhibitors, and is co-organizing a special ASBMB international meeting on Ras and Rho GTPases to be held this month.